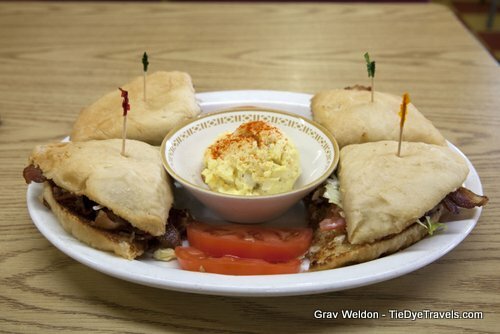 Scratch-Made Sandwiches, Pies and Sides at Kopper Kettle Smokehouse in Alma. 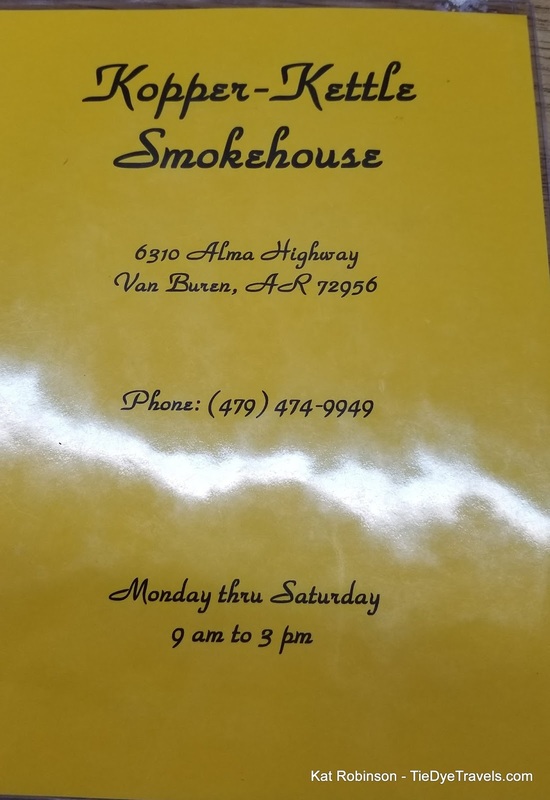 Often overlooked by its more popular partner business, Kopper Kettle Candies, this little gray restaurant alongside US Highway 64 deserves to be noticed. 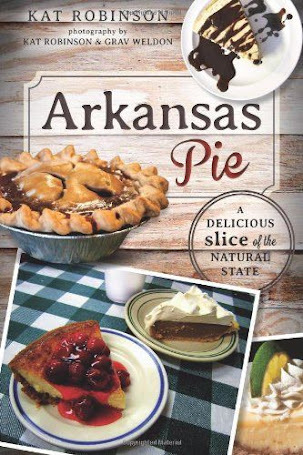 It happened a few months after the original Arkansas Pie: A Delicious Slice of the Natural State came out. Grav had come home to Little Rock, come through the door and was already talking before I had a chance to say "hi." 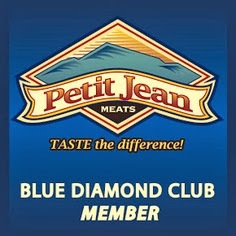 "-do you know, we missed one," he was saying, walking in with a plastic bag of small clamshell styrofoam boxes. "Pie," he told me, taking out the box. 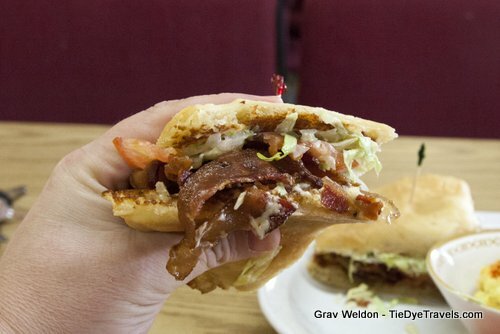 "And a really crazy BLT, too. It's a full pound of bacon." "It is. It's... I haven't found anything like this before. Oh," he said, as I grabbed one of the clamshells, "you can't have that, it's bacon." And he did, by opening one of the other clamshell boxes he'd brought with him. Inside was a pie made of very tightly packed dried fruit. "This," he told me, "is a Japanese fruit pie." "It was just so rich and so good," Grav continued, "I needed to save sone to bring back." "There was also chocolate truffle pie. That didn't make it home." Yeah, I was nonplussed. I mean, he did share photos with me of his visit (which you see here). But I wanted more. 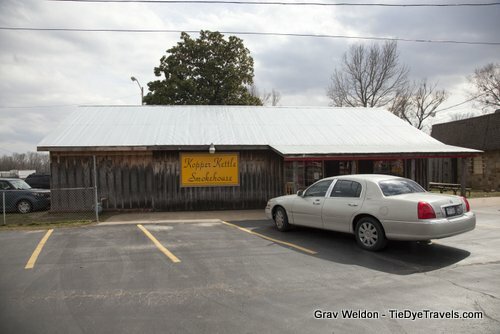 It took nearly five years to get back to Kopper Kettle Smokehouse together. He went - many times. He loved the BLT and I couldn't blame him - he could split it with members of his family and still have leftovers, a sandwich made on a giant slightly sweet homemade bun with a pound of Petit Jean bacon just sounded like epic mealtime. But somehow I kept missing my opportunity to drop in - it was the wrong time of day, we had other assignments, it was Sunday, all that. In fact, it took until Christmas Eve eve (December 23rd) of 2017 that we finally managed to get over there. 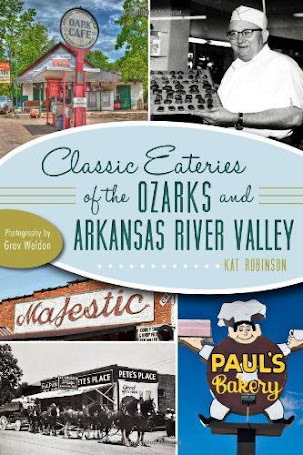 The Great Arkansas Pie Hunt had just begun, and there was no way I was leaving Kopper Kettle Smokehouse out of this book. We arrived early for lunch, right around 11 a.m., and found about half of the restaurant covered in boxes. Pie boxes, actually. Over several tables, stacked in orders for folks to come through. "That's a lot of pies," I found falling from my lips as I entered. "That's nothing," one of the ladies bringing pies to the tables replied. "We did over 800 pies the Wednesday before Thanksgiving." I looked at Grav, who just grinned. We grabbed the one vacant, non-pie-clad table and huddled down with menus passed to us. 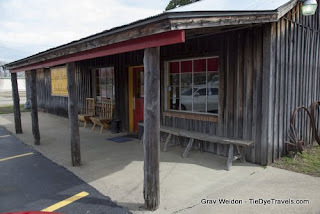 The whole place smelled like hamburger grease and baked crust and roasted pecans and chocolate. Or, as you probably guessed, Heaven's kitchen. The menu was full of good - listings for burgers and sandwiches and yes, that one pound BLT we were obviously not getting. 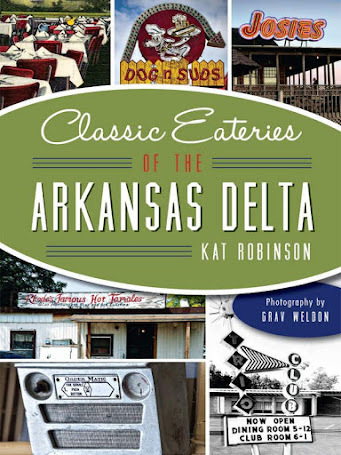 There were some startling similarities to the Red Rooster Bistro, though Kopper Kettle both pre- and post-dates that establishments, having opened its doors in 1981 in a log cabin that had been relocated to sit by the esteemed Kopper Kettle Candies, which is also operated by the Greer faily. Seriously - check out the postcard here. We chose our sandwiches and asked about the pie. Sadly, there was no Japanese fruit pie to be had this particular day, nor was chocolate truffle an option, since the last of those pies had been claimed by a phone-in customer. We were limited to egg custard, peanut butter, pecan cream cheese, lemon icebox, buttermilk coconut, sweet potato, German chocolate, pumpkin or pecan. So Grav went ahead and asked to reserve a slice of pecan cream cheese and I chose the German chocolate. Every time the door opened, another blast of cold air whipped in around my legs. A couple in a booth cattycorner from us chatted back and forth, with the gentleman of the two suggesting repeatedly that we make room for pie. Grav got up a couple of times and took photos and walked around. As we waited, the register by us became busier, as more individuals came in for their pies. It started off with one or two at a time, but by the arrival of our food there were half a dozen people standing around waiting for pie, being tended to one by one. 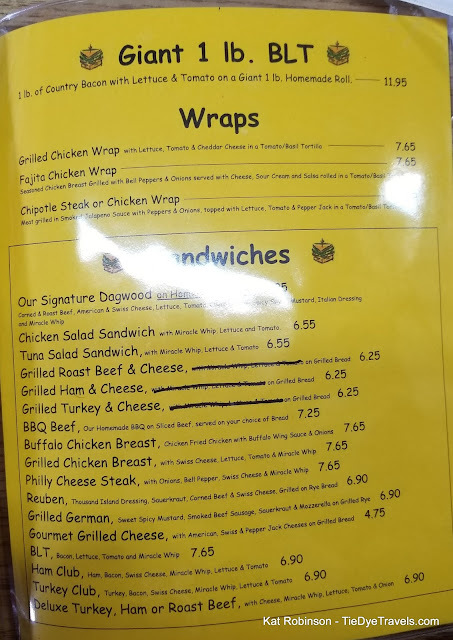 It wasn't enough to distract me from the plates delivered to our table, though, especial to Grav's handsome Dagwood sandwich with its brightly colored layers of onion, lettuce, tomato, corned beef, roast beef, white and yellow cheeses. Perhaps it wasn't the leaning tower once epitomised in the famed Blondie comics, but it was a nice selection of meats, cheeses, vegetation and condiments (Miracle Whip, spicy sweet mustard and Italian dressing) that provided marvelous variation. What made it stand out more? The bread, pliant, yeasty, slightly sweet, such a nice brown butter-kist crust on the outside and so soft within. You can buy the bread to take home, and that tempted me, too. 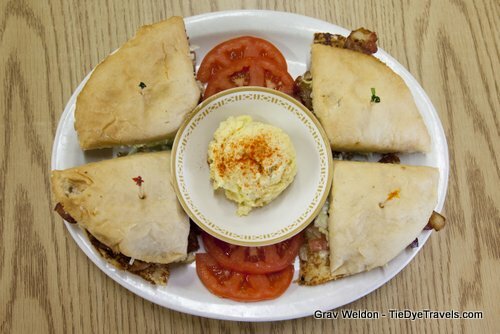 His Dagwood came alongside beans he'd ordered, good hearty beans in a small bowl. For me? 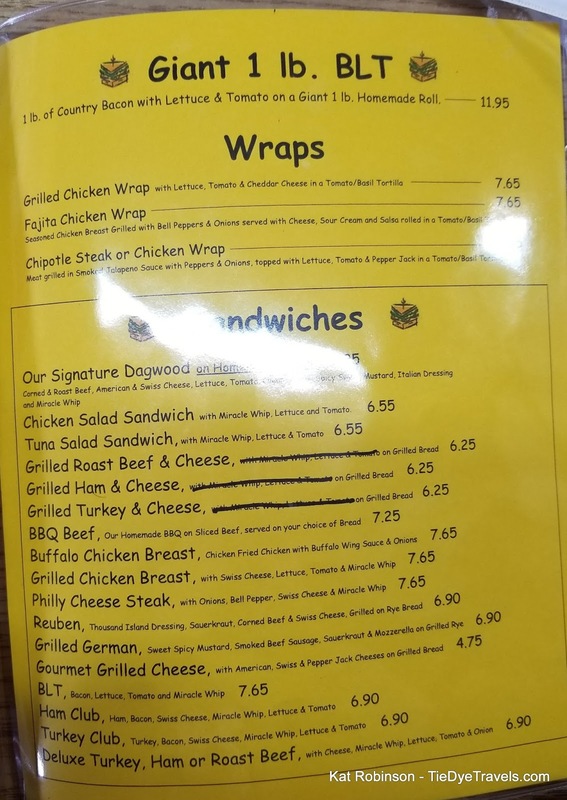 I was entranced with the idea of beef sausage - in the form of the Grilled German, which featured slices of smoked beef sausage, mozzarella cheese and sauerkraut with spicy brown mustard on the sweet bread. 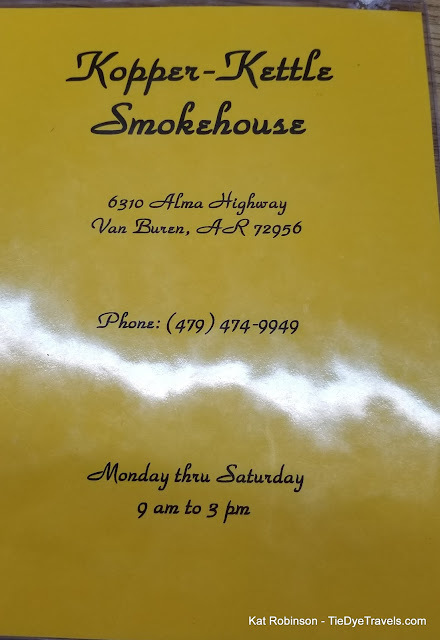 Oh, golly, what a combination - smoked meats, tart sauerkraut and sweet bread all together, better than I could have expected. I could see where it got the name - since it hit all the notes I had come to expect from German country cooking (it did remind me of Emmy's, which I miss) and I could see how it'd succinctly satisfy. 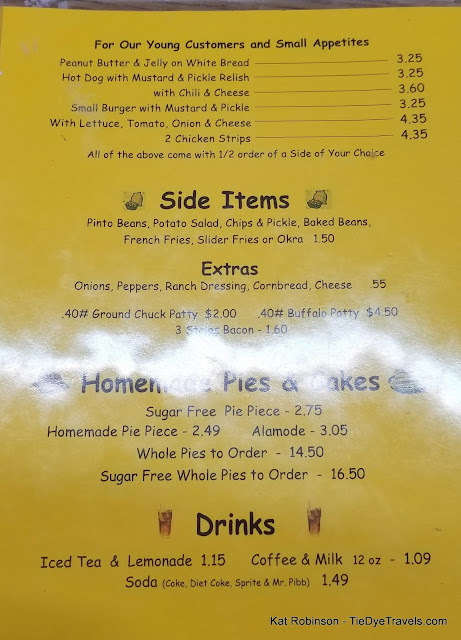 I had "slider fries" with mine, which appeared to be the nice and thick Sidewinder fries you get from foodservice, but I was perfectly okay with that. They're excellent for dipping. We received our pies before we were done with our sandwiches - which was all right, it was really humming by that point with folks coming in and out. 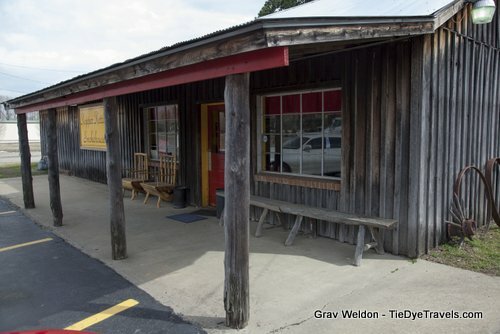 Grav's pecan cream cheese pie was just as good as I assumed it would be - because I could smell it baking when we walked in. It was still warm, and the slightly syrupy pecans were soft, the cream cheese was somewhat molten, and the crust was just barely crunchy. It was good. 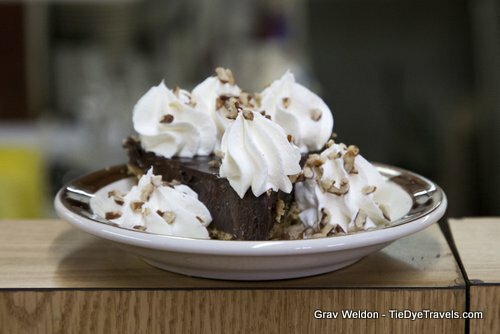 I liked my German chocolate pie better (Grav liked the pecan cream cheese better, for what that's worth) and relished its richness. It was a darker chocolate with a light caramel flavor in the texture, with finely chopped bits of pecans and coconut throughout. The quality was high, the pie was firm, and the desire for a cup of coffee or a glass of milk was substantial. If there's such a thing as stick-to-your-ribs pie, this is it. We didn't stick around too much longer - after all, there were people waiting to get in, and not all of them were waiting for a pie to pick up. We did browse briefly over at Kopper Kettle Candies next door for a couple of minutes before taking off. 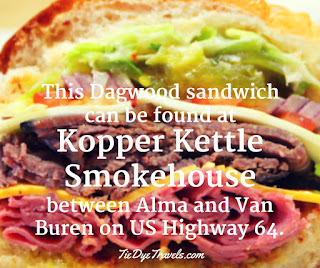 That's all to say, Kopper Kettle Smokehouse certainly deserves our return business. 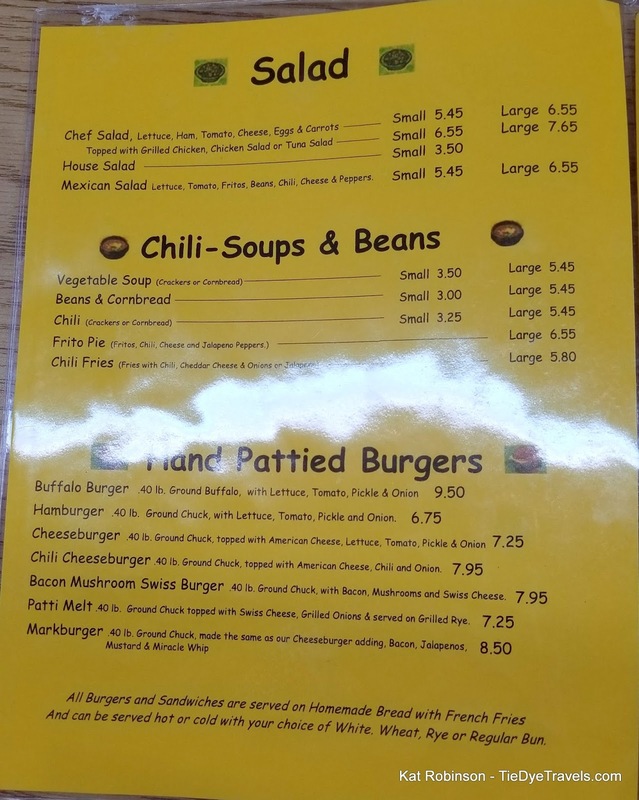 I'm eager to try a burger on one of those homemade buns, or a bowl of the vegetable soup. One way or another, I'll certainly make room for pie. 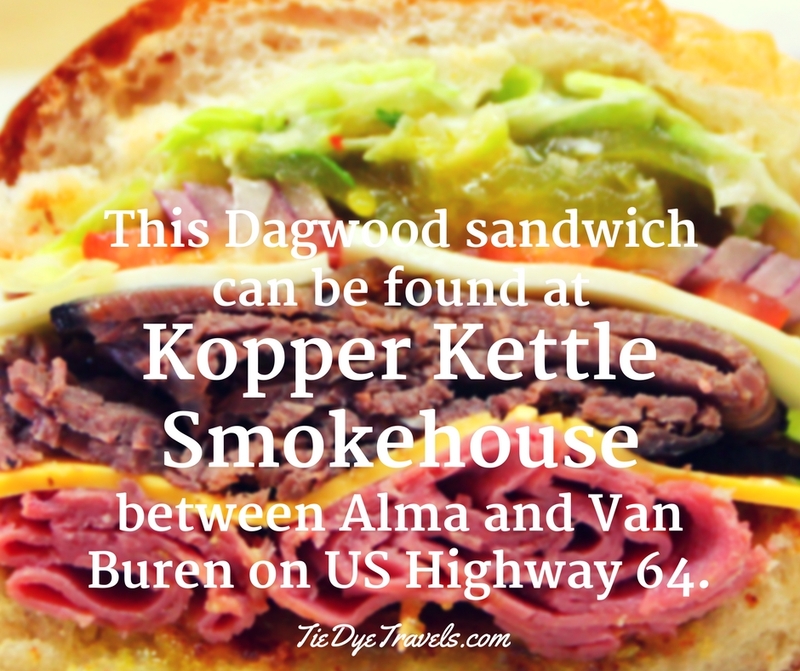 You'll find the Kopper Kettle Smokehouse next door to Kopper Kettle Candies, along US Highway 64 between Alma and Van Buren. Though it sits closer to Alma, it has a Van Buren address. 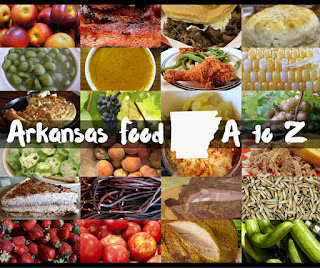 Regardless, for more information, call (479) 474-9949 or check out the Facebook page.